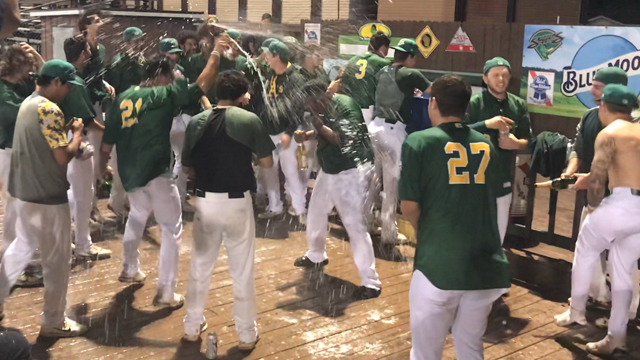 After a six hour and nineteen minute delay, play began as the Snappers knew a win would send them to the postseason with the Wisconsin Timber Rattlers defeating the Kane County Cougars 4-1 earlier in the day. With the Snappers leading 3-2 with two outs in the top of the ninth inning, Seth Martinez with already one strikeout in hand tossed an 0-2 breaking ball and struck out Jacob Pearson to send the Snappers to the playoffs for the first time since 2013. The Snappers fell behind early in the top of the second, as Trey Cabbage singled home Pearson who doubled the batter prior and gave the Kernels a 1-0 lead. Beloit then rallied for three runs in the third as the first three batters reached with base hits. Nick Allen led off the frame with a base knock to left field, before Austin Beck singled to put runners at first and second. Lazaro Armenteros then came to the dish and sent the first pitch he saw in the at bat from Kernels starter Tyler Watson to left to score Allen to tie the game at 1. Two batters later, Ryan Gridley hit a two out two-run single scoring Beck and Armenteros to give the Snappers a 3-1 lead, and that is all they would need. The combination of Gus Varland and Mitchell Jordan the scheduled piggy back starters for the Snappers went a combined 7.2 innings allowing just one run a piece and each struck out four batters. Jordan picked up his eighth victory of the year tossing 3.2 innings surrendering just three hits. Cedar Rapids scored their second run off Jordan in the top of the sixth inning, as Michael Helman singled home Trevor Larnach to bring the Kernels within a run. That is as close as they would get though, as Ty Damron came on in relief of Jordan with two outs in the eighth inning. Damron struck out Larnach on a full count to end the inning and the Snappers were three outs away from the playoffs. After the Snappers went in order in the bottom of the eighth, Snappers Manager Webster Garrison turned to his closer in Martinez. Martinez came in with 14 saves in 18 opportunities and struck out the leadoff man in Michael Helman. Martinez then got Ben Rodriguez to ground out to Nick Allen and the Snappers were an out away from the playoffs! The Snappers closer then struck out Pearson to seal the deal and send the Snappers to the postseason. Game one of the series will be played Wednesday at Pohlman Field, as the Snappers take on the Kernels at 7 p.m. Playoff tickets can be purchased by calling the Snappers front office at 608-362-2272, or online when the tickets are available at 10:00 a.m. Tuesday morning. General Admission $8, Reserved seating $9 and Box seats for $10. For those 62 or older, 5-14 and with a valid military ID will receive $1 off their purchase and kids 4 and under are free.